TvNewsLIES.org • View topic - BUSH'S SHOE-IN: I CAN'T STOP LAUGHING! BUSH'S SHOE-IN: I CAN'T STOP LAUGHING! Post subject: BUSH'S SHOE-IN: I CAN'T STOP LAUGHING! I've seen this scene at least fifty times throughout the course of the day, and it gets funnier every time I see it. Bush's expression says that he doesn't know what the hell has happened, but he sure can duck fast. Now we're probably going to be hearing about his "Watch this duck!" Someone wrote into Jack Cafferty today and mentioned the lame duck president who came close to getting quacked. the angry Iraqi who hurled his shoes at Bush in a near-miss, shouting in Arabic, "This is your farewell kiss, you dog!" The reporter was later identified as Muntadar al-Zeidi, a correspondent for Al-Baghdadia television, an Iraqi-owned station based in Cairo, Egypt. Will the shoes go to the highest bidder for their historical value? Will the owner get the money? Post subject: Re: BUSH'S SHOE-IN: I CAN'T STOP LAUGHING! On the one hand, I'm thinking he got what he deserved with that Arabic cultural gesture. But on the other hand, I'm thinking that the secret service should have been quicker on the draw to block the second shoe at least. I noticed the slow response of the SS, too. 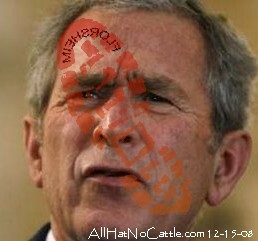 One agent rather sluggishly approached Bush at the podium during the melee that followed the second shoe's flying through the air, but Bush gestured him away, and he obeyed! Didn't look good at all, even though the SS must have been doing something right during the Bush presidency. Otherwise, I'm sure there would have been other times when shoes would have been thrown at Bush...or worse. Some of the responses being posted at the second link I gave seemed to indicate the authors' conflicted emotions about this incident. While they were laughing at the fact that Bush finally got a direct insult aimed at him, but were sorry that the office of the POTUS was so disrespected. Does Bush get Secret Service protection after he leaves office? Both the Chimp and Pickles will for the rest of their un-incarcerated lives. I remember going to the Phoenix airport when Gerry "Quid Pro Quo" Ford was landing in a private jet and the SS locked down half a terminal. Jackie was entitled to the protection but refused. Widows can and have refused protection but as far as I know no former Prez has done so. Bush should have had just the 10 years that presidents are supposed to get, now. But because of Bush's Iraq war mess, he'll get more. I would also give him a GI Joe doll that squawks, "You effed up, boss. You effed up." Oh, by the way, here's something you can laugh at. I heard there are shoe throwing games--thanks for posting one. Iraqi journalist Muntadar al-Zeidi hurled a pair at Bush at a news conference in Baghdad on Dec. 14. Both shoes missed the president after he ducked. The journalist was jailed and is seeking a pardon from Prime Minister Nuri al-Maliki. I was wondering who made those shoes and if it would become popular because of that event. Sounds like it's only distributed in a select area around Turkey. I bet it gets wider interest before long -- like in Europe. Isn't Harrods known for getting whatever to please their customers? There you go -- "Model 271, please." The U.S. promotes better employment as we send our own jobs overseas. Here are new jobs that belong overseas. Why he threw his shoes on me? The War Chimp will get his chance to do that first right thing on January 20th, when he vacates the White House, about eight years too late. I totally agree, APL. Did you hear him saying when he leaves he won't mess things up like Clinton did with the computers missing their W's? Nothing like bringing up more false information--really old false information. Guess it all gets a new life if you wave it around long enough.